Jill Made It: Happy Birthday to My Blog! I love to make stuff. There's just something about taking raw materials and creating something! And I love to see what other people make, get inspired, and learn how to make new things. So here's my contribution. I hope you like my blog. Wow, I think that was also my shortest ever blog post. To celebrate my blog birthday, I want to have another giveaway. I made these flower hair clips for one of you wonderful readers. Thank you all for supporting me in my blogging. I love reading your comments, and hearing about you making my projects. 1--Tell me which of my posts is your favorite. 3--Share your favorite of my posts on your blog, with your Facebook friends, or with your Twitter followers. The winner will be chosen on Friday, November 18. I love your gold bracelet post. Stunning! I have some pearls I got a while back that I may try and pair up with some golds now and make myself one. Also have your tutu round up starred for future reference. Thanks for that! Out of all my crafty hobbies, I am on a sewing spree right now and tend to skim through posts that are not sewing/quilting. 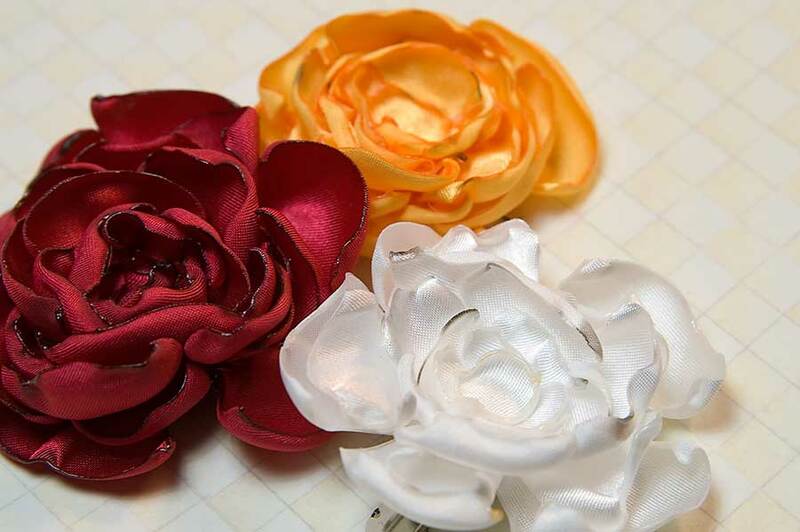 But I have a baby girl too, so making awesome fabric flower clips catch my eye too. I like you on FB! PS you have seen Valori Well's new line Karavan, haven't you. Your elephant reminds me of it every time I see it. Jill thats amazing that you've been blogging for a year! And not just I am posting to get a post in, but you always have real projects! Amazing! 1. It is so super hard to decide which one is my favorite. I love a lot of them! I did however really enjoy your Halloween themed month of october, that was so fun! It makes me want to ask if you are gonna have more themed months I did really love your swim suit cover up, your message board craft & etc. 2. I would love to see some painting! I know I would love to learn how to do a water color! 4.I already follow you on facebook! Sweet! Thanks Jill, I love your blog so keep posting! The "I love Daddy" post is just adorable, and I liked the pearly jewelry post. I liked the pictures of the jewelry hanging off the basket. I don't know why my comments didn't show up? So 1. It's so hard to choose a favorite! I love so many of them from your swim suit cover up to your daddy I love you!mi did really love your Grammies workshop sign because of the chalk trick, who knew? That was awesome to learn! 2. Jill I would for one really like to see more on painting, that's something I'd love to learn! Especially how to do water color! I think some painting tutorials would be awesome!!!!!!! 3. I shared your message board, another of my favorites, on my facebook wall! Does it count if I blogged and shared on facebook awhile ago of my favorite post of yours? I LOVE the "How to" for the baby quilts...especially since my kids were the lucky recipients of said quilts! I also loved your "I love Daddy" post...I used it for Andrew's Father's Day present. I am also a follower/fan on Facebook, and I think I am following your blog! I can't figure out where to find it! I would love to see more baby sewing tutorials, especially for boys (I know you don't have a little boy but it would still be fun!). There isn't as much cute stuff for boys, so maybe some fun tutorials for boy things! Keep posting your amazing ideas/creations, I love seeing what you come up with!